KNAPHILL manager Keith Hills is not underestimating the pedigree of their FA Vase opponents this Saturday, writes Andy Fitzsimons. The Knappers play host to Spartan South Midlands League Division One side Southall in the third round at Redding Way for a chance to reach the last 32 of the competition. And while The Hall play one level lower in the football pyramid than their Combined Counties League counterparts, Hills is expecting a tough match. 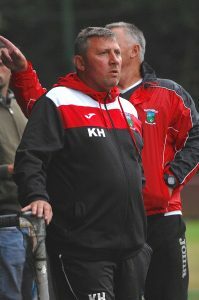 UPBEAT: Keith Hills entrusts his players to get a result against Southall. Picture by: Andy Fitzsimons. He said: “From the people I’ve spoken to, I know that Southall are a strong team, which have a bit of history in the FA Vase. “As a club, they’ve had their ups and downs, but they beat Camberley Town 4-0 in last [second] round, which is no mean feat. “Camberley are a very good side in our league, so it proves to me that Southall are capable of anything on their day. “They have two very quick wingers and a fast centre forward, so we will need to be on our game to deal with them,” he added. Knaphill’s opponents, who currently groundshare at Hanwell Town, have come good in recent time after spending years in the doldrums, which included a high profile ownership wrangle back in 2000. At the centre of the controversy was former Southall and Farnborough Town chairman John Gurney, who was previously arrested and remanded in Winchester prison on a charge of conspiracy to import cocaine. He was later cleared on, reportedly, Queen’s Counsel evidence. In 1986, the Middlesex-based club were playing in Division Two South of the Vauxhall-Opel (Isthmian) League and reached the final of the FA Vase, only to lose 3-0 to Halesowen Town. On that day, The Hall had a young Les Ferdinand playing for them. But for Hills, the past is the past and present will aid Knaphill’s future. And the Knappers’ boss looks forward to welcoming back five players who were absent during the 5-2 home defeat against Sutton Common Rovers. “If Southall had us watched last Saturday, they are likely to see a different team this weekend, although our game-plan will remain the same,” explained Hills. “We’re not a new team any more: the players know what they’re doing, and what I expect of them, so I’m not going to change how we set-up against Southall. “I’m quite superstitious. I go by the same rituals in the build up to a game, and set up how we’ve always set-up, which allows for some tweaking if needed. “I’ll go for breakfast with my coaching staff in the morning; have my usual cup of coffee before the match, then walk to the dugout a minute or two before the players enter the pitch. It’s a bit like a footballer that puts on his left boot before their right,” he added. Hills will be hoping for more of the same from Charlie Postance this Saturday after the inform striker netted his seventh goal in three games against Sutton Common Rovers last weekend.